This is but part one of a six part series on these devilish devices. This will end in disaster, I just know it. There may or may not still be an active defense network around the Neu Schwabenland UFO base, if there is then the expedition may be destroyed. 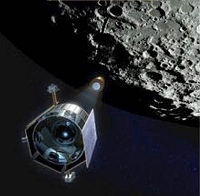 Giant Liquid Telescope on the Moon? You have got to be kidding. Don't the big wigs at NASA know that this will last a year, maybe two? 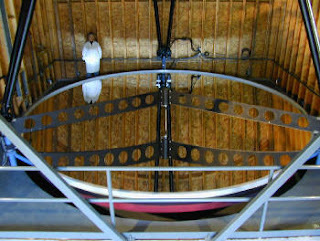 As soon at the egg heads at the New Schwabenland Lunar Research Station find out then it's going to be curtains. I suspect that this is a thinly veiled plot to establish a beachhead for a troop deployment to wipe out the Nazi hoard once and for all. Hoo boy! With that ever be a fight! 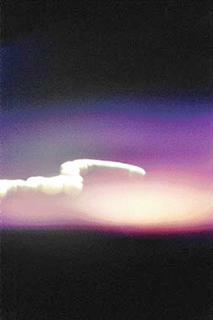 The cover story for this is the same old same old, looking for water in a dark crater by bombarding it and sifting through the plume of dust ejected by the impact. Only this time they will find more that lunar rigolith! Steel, aluminum, titanium, human remains... I must give pause as to how these findings will be covered up! Obviously the 'Shepard' satellite that is going to do the close flyby through the plume will suffer a 'sudden loss in communications' at zero hour. He must have seen a rare out gassing of one of the covered craters that are used by the moon base. "I have the evidence," he says, revealing a series of photos which he took one cold October evening nearly two years ago. He learned through the evening news a rare lunar eclipse was set for cosmic alignment that very evening. Not of this Earth? What bunk! What this guy saw was clearly evidence of the famed German moon base. 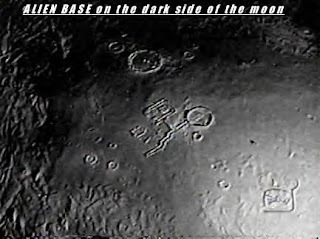 Moon Base Photo Said Seen By Top Security AF Vet!